Unless indicated below, this is a transcript of the original Society for the Preservation of Long Island Antiquities/Town of Brookhaven survey form. Corrections to obvious typographical and spelling errors have been made. Corrections to factual errors, updates or comments on the information are either enclosed in [square brackets], or will be clearly indicated as updated material. Since most of the surveys were conducted in the late 1970's and early 1980's, much of the information reflects that time period. Sites with an Inventory Code suffix of "S" are supplemental sites not included in the original surveys. If checked, this is a Supplemental Form, not in the original surveys. Submitter Address: 7 Locust Rd. 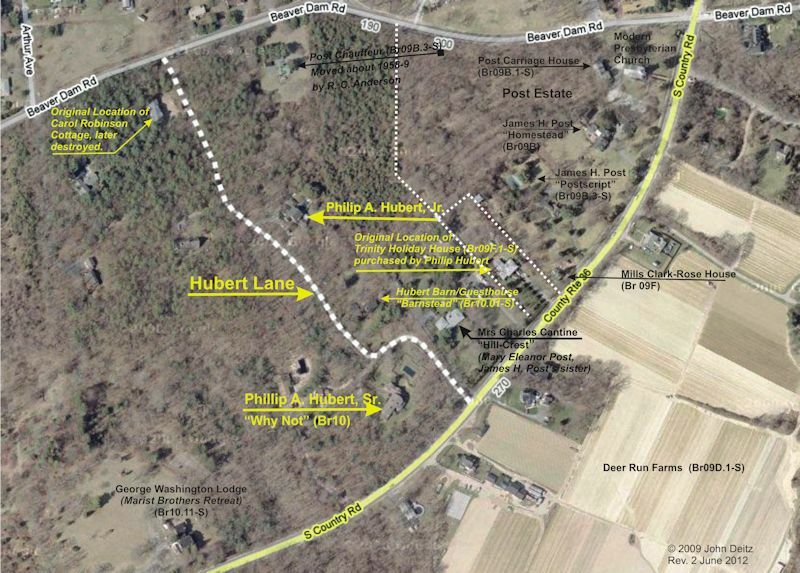 Hubert Lane is a private lane that stretches north from South Country Road rhrough the fomer Hubert Estate to Beaver Dam Road. 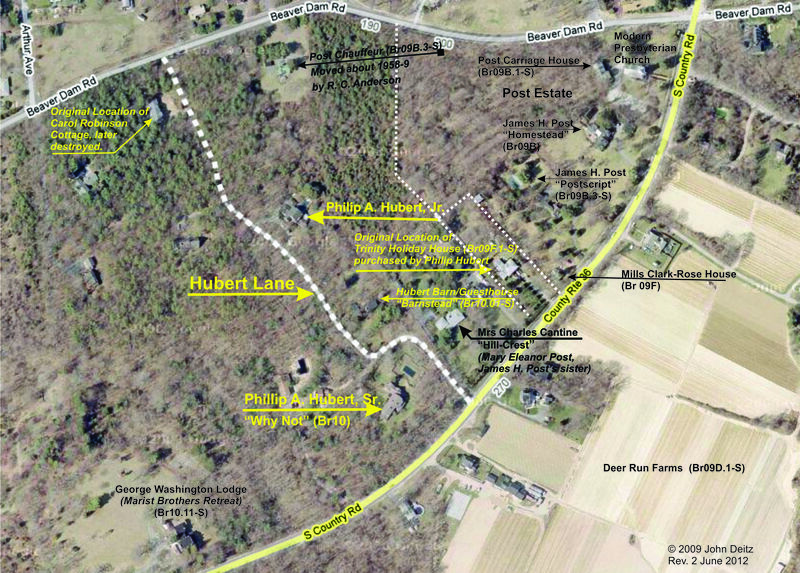 The Hubert propery originally extended from South Country Road through to Beaverdam Rd., and included about 25 acres. The lane originally provided access to Phillip A. Hubert, Sr.'s country home, called "Why Not." It was eventually extended through to Beaver Dam Road, and included several other dwellings, including one built for his son, Phillip A. Hubert, Jr.
Near Beaver Dam Rd. was a small "prefabricated" cottage use by Carol Robinson after she vacated the cottage she lived in near to Beaver Dam Creek (see Historic Sites ID Br09E). Also on the estate were several barns and outbuildings, some of which have been converted to residences. The main barn near the main residence was modified by the Huberts into a guest house, call "Barnstead."